More like the Gouda you’re probably used to. This is a soft smooth very mild tasting Gouda cheese. It’s origin is Holland. And while not an officially protected Gouda cheese by name, it does have a good lineage. There’s a very slight sour taste as the cheese clears the back of the throat. It’s almost soft enough to be spreadable. But only almost. It’s easy to slice. So make a few slices and see how it tastes on maybe some of TJ’s own Multigrain Crackers. I did. It worked out well. This Gouda comes with a red wax paraffin coating. That usually means the cheese has been aged between one and six months. The softness of this cheese also attests to a relatively short aging time. As Gouda ages longer, the cheese hardens up some and the flavor becomes stronger. This is a young Gouda cheese. At $5.49 per pound this is an affordable Gouda cheese. It’s not smoked or flavored in any other way. If you like your Gouda with a twist, you’ll have to look for a different package. It doesn’t come with the little green hat. 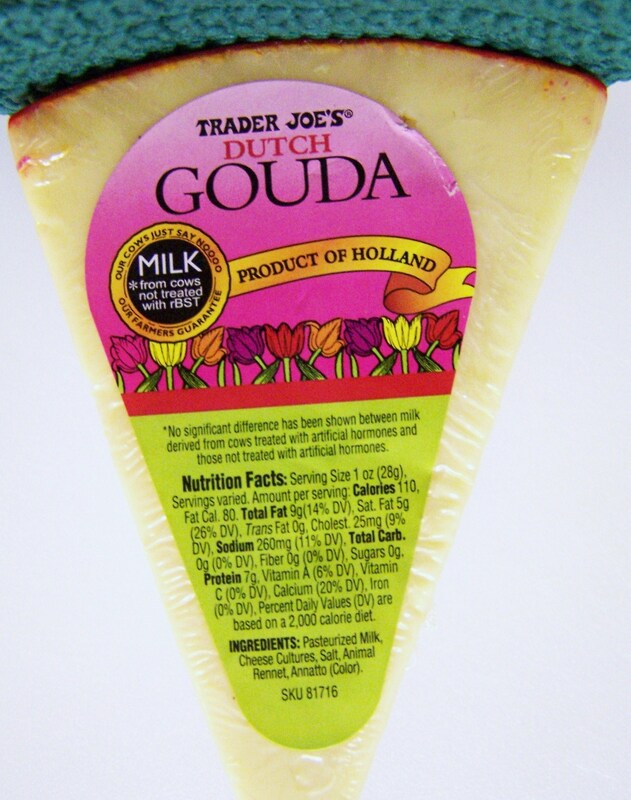 Trader Joe also sells a sheep’s milk Gouda reviewed in another post. Take a peak there. The sheep’s milk Gouda is a much stronger tasting cheese and not very soft at all. This entry was posted on 06/11/2011 at 09:57 and is filed under Recipes, food, cooking and related items, Trader Joe's. You can follow any responses to this entry through the RSS 2.0 feed. You can leave a response, or trackback from your own site.